Click here to read about Peter Heller's Salt Lake book signing at the King's English bookshop. Jim Stegner has a long history of violence trailing him when The Painter opens with his struggle to start a new life in rural Colorado. Jim is a well-known expressionist painter and left the art scene of Santa Fe when his daughter was murdered and his marriage fell apart. In Colorado he continues to paint, using a young and feisty model named Sofia, and spends most of his spare time (even some late nights) fly-fishing. Even as Jim tries to move on, he is haunted by his violent past and the ever-present anger he holds against himself for the circumstances pervading his daughter's death. One day he is driving to a choice fly-fishing area when he crosses paths with a man who is brutally beating a small horse, Jim reacts instinctively and becomes blinded by his rage. This one brutal encounter makes him turn to face the wake of violence and loss he has been trying to escape for years. Jim is then harassed by his own conscience and two men who are out for revenge. The Painter is heart-wrenching, filled with suspense and savagery, art and violence, all the inconsistencies and imbalances that make us human, but most of all it is filled with beauty: "I don't know if truth is beauty or not but I have always put my stock in beauty every time, the real thing, the one that comes with cold rain and hard stories..." The Painter is a hard story about a man who wants to be a good person and do the right things in order to make the daughter he lost happy and proud, seeking forgiveness from her spirit that haunts him. Peter Heller has already made himself known as a bestselling author with his debut novel The Dog Stars, a post-apocalyptic journey, The Painter is an entirely different kind of story. However, it utilizes the same tone and style everyone came to love while reading The Dog Stars. Peter Heller is a poet and knows how to use paragraph breaks and negative space to his advantage, making the entire book a work of art and sparse prose. Every paragraph, every line, has a purpose and felt necessary to the whole work. Many times Heller simply has a word as a sentence itself. "Well." That one word takes hold of the reader, took hold of me, every time and forces the reader to ponder all of the possibilities that could follow or be encapsulated from the words coming before it. I loved the way Heller described and imbued all of the characters in this book by looking at them through Jim's scope. I felt like I knew each character the way Jim knew them; I felt connected to or disconnected from every character depending on the way Jim saw them and reacted to them. I will be honest that the ending did not resonate with me as much as I hoped it would, based on the rest of the book and how I felt reading it. I wanted a different kind of resolution, but I'm sure many people would find it the perfect way to end Jim's story. There were also a couple of things Heller alluded to, or at least I perceived that he alluded to, that didn't end up being resolved or explained in a way I found satisfactory. I hate spoilers in book reviews and I encourage all of you to read this awe-inspiring work without me ruining anything for you, so feel free to contact me, or start a discussion in the comments below, if you want to know more about what specific things I am talking about in the book. There were also detailed images of a sexual nature and a lot of swearing, the f-word was on most pages, but more often than not I was not phased by the sexual content or language because I simply felt invested in Jim's perspective. It was natural to read those things because they were part of Jim's character. I was all in and I couldn't come out until I knew what Jim knew, found what he found. 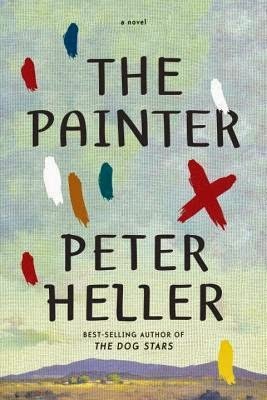 Overall I really liked The Painter and I think I will read it again someday, as well as recommend it to anyone who likes art, fly-fishing, or good books. I chose non-alcoholic beer as the drink to pair with this work because of the comfort it brings Jim during one particular time of stress in his story. He tries his best to not drink alcohol, because of the way it tends to make his violent reactions worse, but he often thinks about drinking alcohol because of the release it provides as well. He lets himself indulge in an alcohol free beer and it helps, as it might help a reader trying to cope with the suspenseful scenarios. At one point Jim says, "I felt the terrible vulnerability of everything, and the depthless peace of the evening, and I wondered that God could have made such a doubleness, allowed it all to exist together so that we might feel so helpless." So take on some "doubleness" yourself while reading The Painter and have a non-alcoholic beer to quiet your nerves and prepare you to take a journey with Jim, one that will change how you look at art and violence in the world. Well.